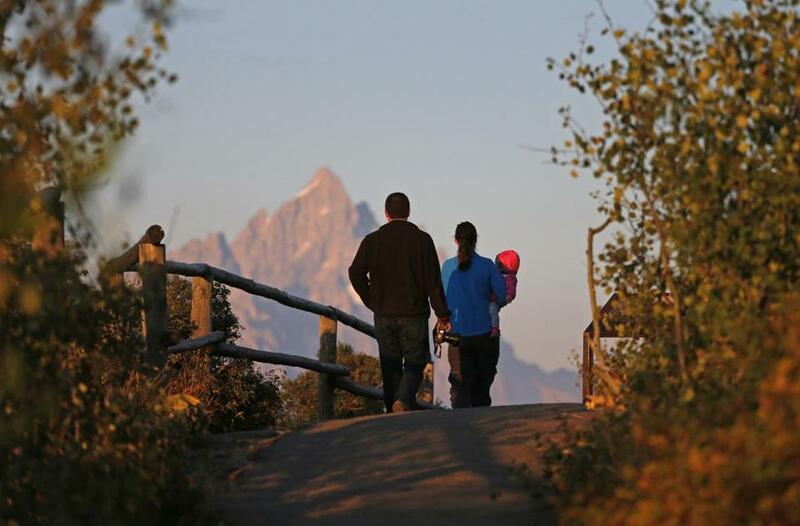 Visitors and their baby strolled near mountain peaks in Grand Teton National Park, Wyo. SALT LAKE CITY — Visits to US national parks set a record in 2016 for the third consecutive year as landmarks such Zion, Yellowstone, and Rocky Mountain experienced historic levels of popularity. The surge in attendance brought collateral headaches stemming from overcrowded roads and trails and increasing visitor misbehavior. It created a good news-bad news story for park managers. They praise the increased interest but are struggling to preserve iconic mountains, slot canyons, and wildlife habitat for future generations. The National Park Service budget has remained basically flat, leaving parks to grapple with the problems without higher staffing levels. The National Park Service launched a major marketing campaign to celebrate its 100th birthday in 2016, including free passes for fourth-graders and their families. That renewed attention coupled with reasonable gas prices and an improved economy likely fueled the increase, said National Park Service spokesman Jeffrey Olson. The agency’s ‘‘Find Your park’’ campaign will continue this year and officials expect to surpass 300 million visitors again even if there’s no record, Olson said. Absent December totals, the Grand Canyon in northern Arizona hit 5.9 million visits. Yellowstone, which stretches into Wyoming, Montana, and Idaho, had 4.3 million visits.